The traditional Intelligence Cycle is the process of tasking, collecting, processing, analyzing, and disseminating intelligence is called the intelligence cycle. The intelligence cycle drives the day-to-day activities of the Intelligence Community. It starts with the needs of those who are often referred to within the Intelligence Community as intelligence "consumers"—that is, policymakers, military officials, and other decision makers who need intelligence information in conducting their duties and responsibilities. These needs—also referred to as intelligence requirements—are sorted and prioritized within the Intelligence Community, and are used to drive the collection activities of the members of the Intelligence Community that collect intelligence. Once information has been collected, it is processed, initially evaluated, and reported to both consumers and so-called "all-source" intelligence analysts at agencies. All-source analysts are responsible for performing a more thorough evaluation and assessment of the collected information by integrating the data obtained from a variety of collection agencies and sources—both classified and unclassified. This assessment leads to a finished intelligence report being disseminated to the consumer. 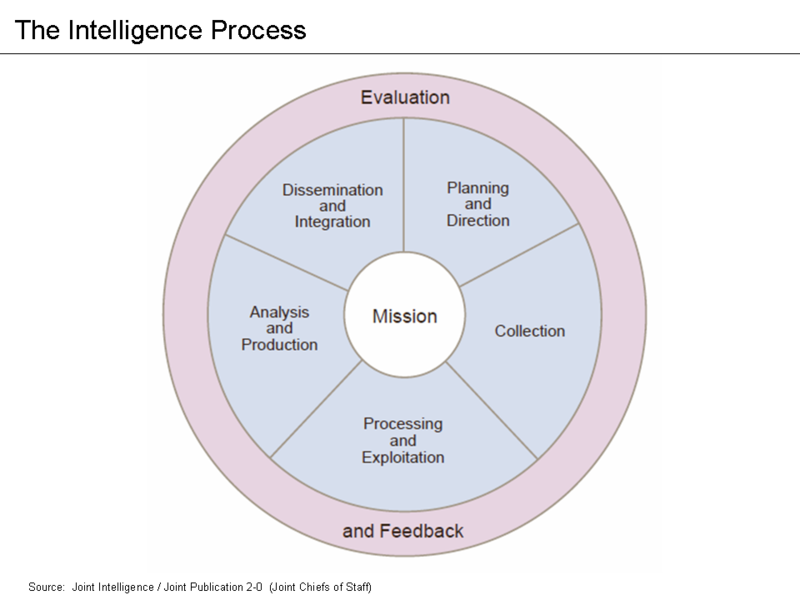 The "feedback" part of the cycle assesses the degree to which the finished intelligence addresses the needs of the intelligence consumer and will determine if further collection and analysis is required. The cycle, as depicted in the figure below, is thus repeated until the intelligence requirements have been satisfied. Identifying requirements means defining those policy issues or areas to which intelligence is expected to make a contribution, as well as decisions as to which of these issues has priority over the others. It may also mean specifying the collection of certain types of intelligence. The impulse is to say that all policy areas have intelligence requirements, which they do. However, intelligence capabilities are always limited, so priorities must be set, with some requirements getting more attention, some getting less, and some perhaps getting little or none at all. The key questions are: Who sets these requirements and priorities and then conveys them to the intelligence community? What happens, or should happen, if policy makers fail to set these requirements on their own? In response to requirements, an intelligence staff develops an intelligence collection plan applying available sources and methods and seeking intelligence from other agencies. Collection includes inputs from several intelligence gathering disciplines, such as HUMINT (human intelligence), IMINT (imagery intelligence), ELINT (electronic intelligence), SIGINT (Signals Intelligence), OSINT (open source, or publicly available intelligence), etc. Collection produces information, not intelligence. 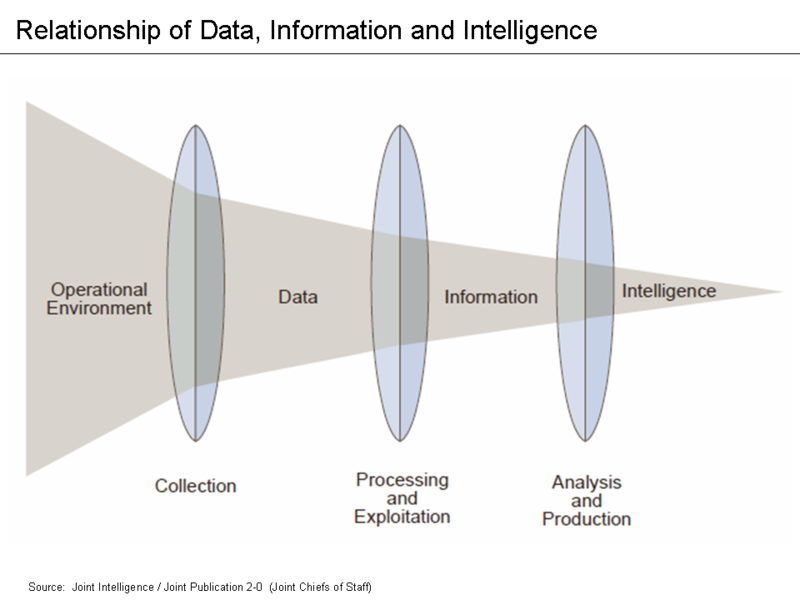 That information must undergo processing and exploitation before it can be regarded as intelligence and given to analysts. Conversion of large amounts of data to a form suitable for the production of finished intelligence includes translations, decryption, and interpretation of information stored on film and magnetic media through the use of highly refined photographic and electronic processes. Identifying requirements, conducting collection, and processing and exploitation are meaningless unless the intelligence is given to analysts who are experts in their respective fields and can turn the intelligence into reports that respond to the needs of the policy makers. The types of products chosen, the quality of the analysis and production, and the continuous tension between current intelligence products and longer-range products are major issues. Analysis and production includes the integration, evaluation, and analysis of all available data, and the preparation of a variety of intelligence products, including timely, single-source, event-oriented reports and longer term, all-source, finished intelligence studies. Finished intelligence products take many forms depending on the needs of the decision maker and reporting requirements. The level of urgency of various types of intelligence is typically established by an intelligence organization or community. For example, a threat assessment or tactical response bulletin would require higher precedence than an annual report. ​to ensure that the decision and policy makers review and provide on-going guidance to the intelligence process. A dialogue between intelligence consumers and producers should take place after the intelligence has been received. Policy makers should give the intelligence community some sense of how well their intelligence requirements are being met, and discuss any adjustments that need to be made to any parts of the process. Ideally, this should happen while the issue or topic is still relevant, so that improvements and adjustments can be made.